2D button mashing, delightfully weird universes, insanely gorgeous artwork. These are the things one thinks of when they hear the name Vanillaware (assuming they know who they are in the first place). After the widespread acclaim of Odin Sphere and Muramasa, George Kamitani applies his craft to a game that emulates the arcade side-scrolling brawlers of old even moreso than any of his past efforts. Dragon’s Crown is Vanillaware’s first multiplayer 2D brawler, and like its predecessors, involves 2D button mashing, an interesting world, and some insanely gorgeous artwork. But is it actually fun to play? The story of Dragon’s Crown is a simple one. 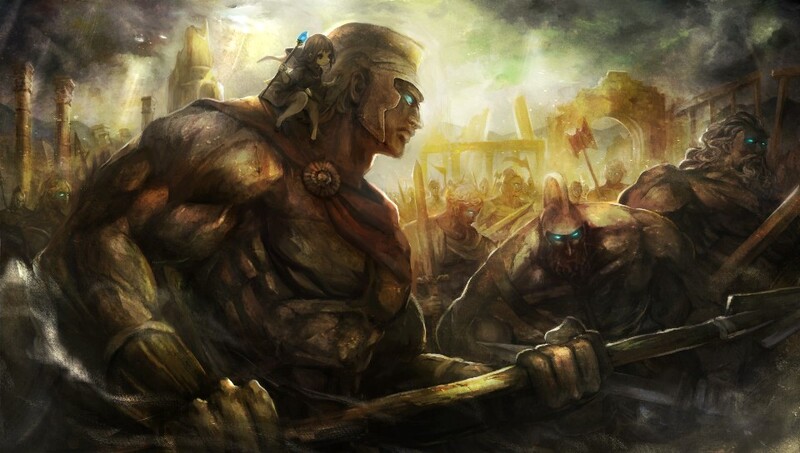 The kingdom of Hydeland is in turmoil, as forces from both this world and beyond conspire to destroy it. 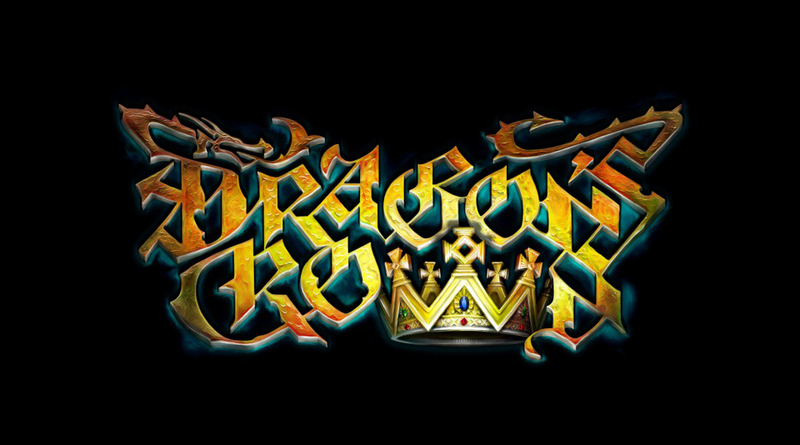 You play as one of six adventurers who seek the eponymous Dragon’s Crown, a powerful relic that has the ability to control dragons. Presented in the form of an active narrator, akin to a DM from a Dungeons and Dragons session, you embark on your quest to defeat monsters, save the kingdom, and most importantly, get loot. Unlike Vanilaware’s previous efforts, Dragon’s Crown is very sparse on story. Whereas Odin Sphere told a grand epic of its cast’s struggles against fate and Muramasa told a small and contained narrative of two individuals in a wildly eccentric feudal Japan, Dragon’s Crown’s narrative is simple, to the point of it almost not existing. That isn’t to say the world is boring, the unlockable treasure artworks (which I’ll get to later in the review) tell of a world beset by monsters and heroes alike. But if you were hoping for an engaging story to draw you into the word, you will be disappointed. At its heart, the game is a 2D brawler that would be at home in an arcade, and the story reflects that. 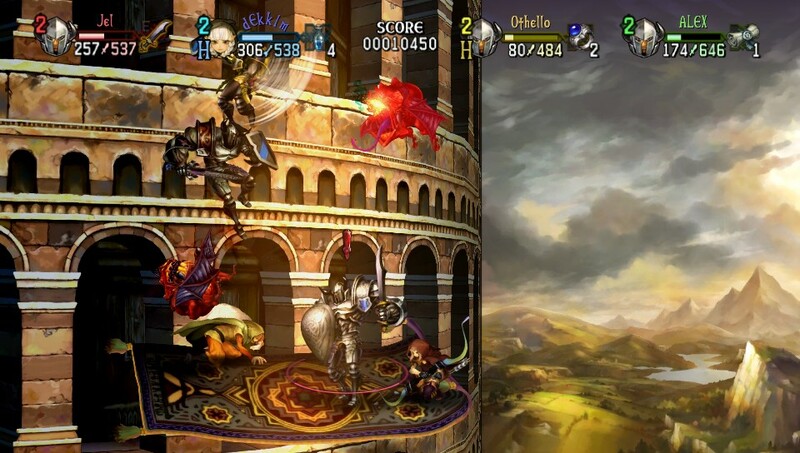 Dragon’s Crown plays like an arcade style brawler. Your heroes move on a 2D plane with some limited z-axis maneuvering. 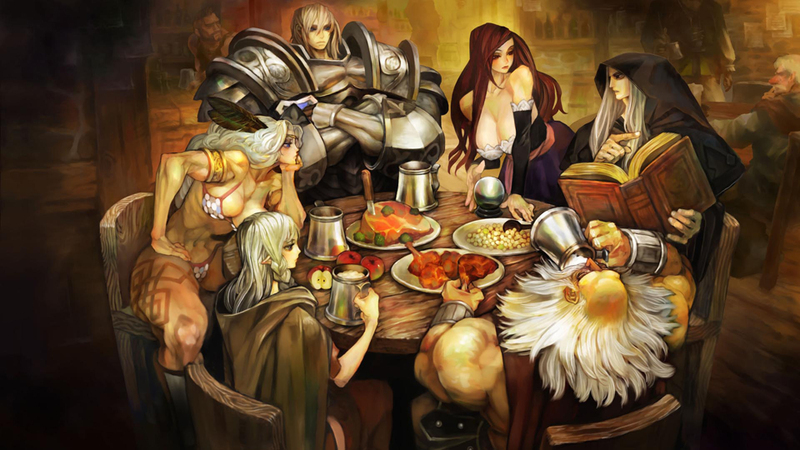 However, unlike some representatives of the genre, Dragon’s Crown is not only fun, but quite complex. 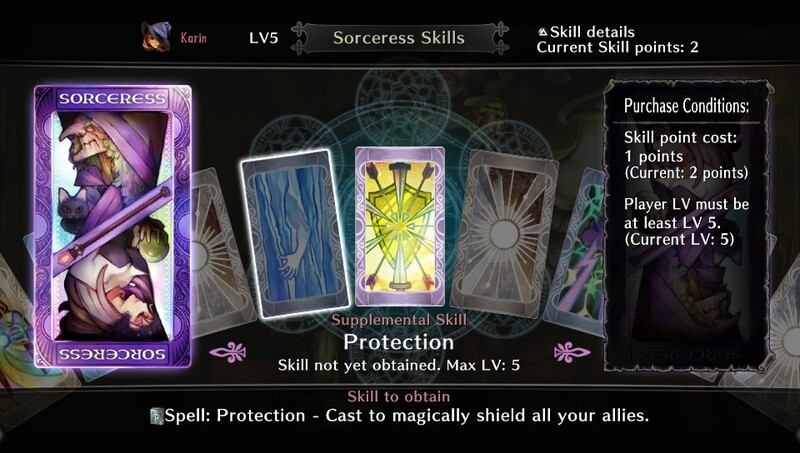 Each of the six classes have a different moveset and unique skills available to them. The Amazon can become a whirling cyclone of blades, each attack growing faster with every hit. The Dwarf is an unshakable pillar of muscle, throwing those who get in his way and pounding those who don’t into the dirt. The Wizard, while slow and squishy, can change the entire outcome of a battle with powers such as the ability to slow time and summon meteors crashing down. Within these six archetypes are skills that allow you to customize your character to your exact tastes. Will your Dwarf wrestle his opponents to the ground or rain bombs upon them? Will your Sorceress summon the dead to her aid, or conjure up health-restoring food and magical shields to protect her allies? The number of different skills means that the same class can end up playing in vastly different ways. 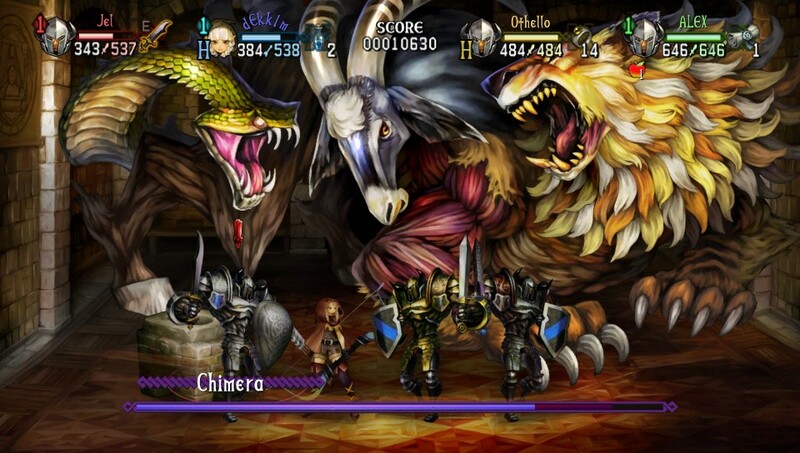 In a sense, Dragon’s Crown is almost more like a 2D Diablo than an old-school brawler. And speaking of Diablo, loot is an integral aspect of the game, and perhaps the part that makes it so addicting. Each chest contains an unlabeled piece of treasure with a rank, ranging from E to S. To actually use your treasure, you must get it appraised, a callback to classic Dungeons and Dragons. Honestly, you’ll reach a point where you’re so rich and powerful you can afford to dump anything that’s less than A-rank, but the system is fun and the mercantile glee of getting 4 or 5 S-ranks in the span of a few dungeons can put a smile on anybody’s face. That said, Dragon’s Crown isn’t without its flaws. In a way many at the GLORIO crew have phrased it, Dragon’s Crown suffers heavily from the eccentricities of Japanese game design. Online multiplayer is locked until you complete each dungeon once, a task that can take anywhere from 4-9 hours. While it serves as a handy tutorial, the fact that it’s forced on every character you create makes the beginning of any character a bit of a chore. Online itself is quite wonky, with players needing to rejoin each other each time they return to the town. 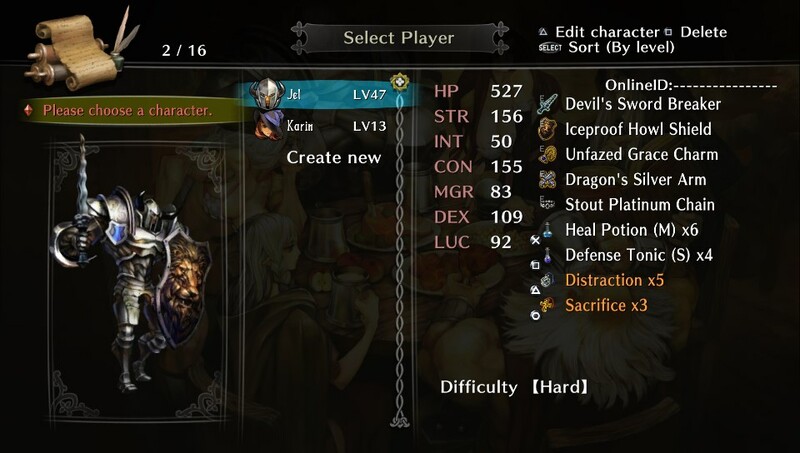 In addition, unlike other quest based games, Dragon’s Crown has no retroactive quest completion, which means if your online party completes a task for a quest you haven’t signed up for, it won’t be registered as being completed. Combine that with only being able to take on five quests at a time and you have a situation that can often be frustrating, as your party goes to a dungeon and accomplishes a difficult task, only for you to find out as you return to town that there’s an exact quest that requires what you just did. Still, multiplayer is a joy in and of itself, and while it can be chaotic, what with Dwarves summoning lightning, Wizards calling forth blizzards, and Amazons spinning like a weaponized Sonic the Hedgehog. A flurry of numbers and visual effects make for a pretty and satisfying game, but also one that can become incomprehensible at times. Still, if you’re a fan of 2D brawlers, then I’m sure this is all old hat to you. It’s a shame online multiplayer has a time-based price of admission, but once you get things started, it’s a load of fun. 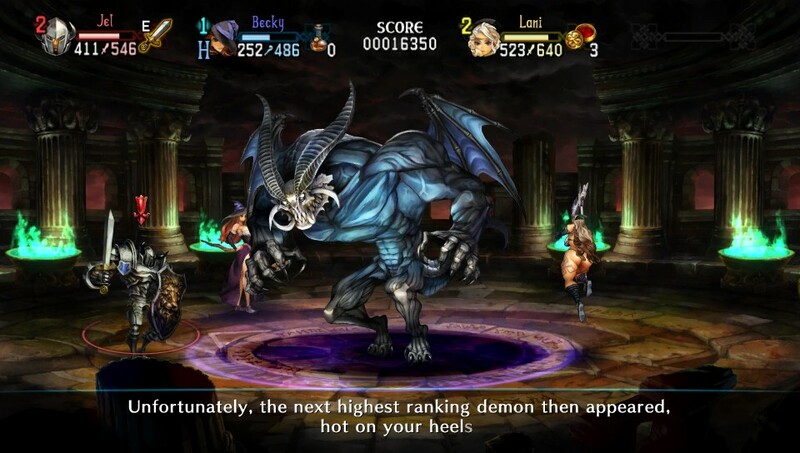 Those familiar with Vanillaware will know exactly what they’re getting into with Dragon’s Crown. The game is utterly gorgeous, every character meticulously animated and every background gorgeously painted, with the entire game coming together as a visually impressive tribute to the fantasy fiction that defined the genre. The characters are less people and more icons of the very archetypes they represent. The characters move with fantastic fluidity, with even the static portraits brimming with subtle flourishes that truly give them life. Kamitani’s penchant for stylization and blended colors is quite apparent in the game, with the characters and monsters alike being a joy to look at. A particular shout out to the dungeon select screen, which might be one of the most gorgeous menus I have ever seen in my life. Another great bonus are the treasure artworks, unlocked by completing optional quests. These artworks, illustrated by various members of Vanillaware, include a paragraph blurb related to the world of Dragon’s Crown. While the descriptions themselves are a bit formulaic, it adds some depth to the universe. It’s a universe that lives and breathes the founding pillars of pulp fantasy, from Frazetta to Dungeons and Dragons. Like everything Vanillaware, the treasure artworks are magnificent to look at and the art itself is almost more a reward than the in-game rewards themselves. Jel: I’ve been playing Dragon’s Crown on both PS3 and Vita (from which our screenshots have been taken) and I’m happy to report that aside from the smaller screen and very minor slowdown, the experience is identical. In some areas I even think it’s better, particularly the use of the touch screen to point out treasures. There is no cross buy or cross play which is disappointing and expensive, but you do get the option of uploading your game data right from the title screen. While it’s not as good as crossbuy/play, it’s a painless process and a fair compromise that lets you get the most out of playing both versions. Even on it’s own though, Dragon’s Crown is one of the best pure gaming experiences on the Vita and a must buy if you do a lot of gaming on the go. Having a pixel perfect rendition of such a gorgeous, addicting game in handheld form just might make your decision on which version to buy much harder than expected. If you don’t need the portability, it’s probably still best to experience Dragon’s Crown on the big screen, but you definitely will not be disappointed if playing on Vita. Dragon’s Crown is like many of Vanillaware’s previous efforts: Fun, slightly flawed, but wonderful to take in all the same. It’s a true love letter to both the classic fantasy genre and arcade brawlers, both byproducts of a different decade. Every piece of its aesthetic contributes to a comprehensive art direction whom’s quality cannot be denied. And yet in some ways, it suffers because of its desire to emulate another time. The online is hopelessly archaic and certain mechanics and design choices make one wonder if Vanillaware has played a game made in the last 10 years. Things we Western gamers take for granted, they seem to barely grasp the concepts of. That said, it’s a testament to the quality of the game, that they don’t take away from its good traits. It’s definitely one of the most well-executed games I’ve played this year, and if you’re a fan of 2D brawlers, you owe it to yourself to consider the game, even if its wild and sometimes strange art style doesn’t enthrall you. And for those of you who can’t tear their eyes away from Kamitani and Vanillaware’s fantastic art, Dragon’s Crown is a treasure worth more than any worthless crown.